Requirements: Amiga and Atari ST computers with 512K minimum memory; versions also available, with slightly different features, for Commodore 64, Atari 800/XL/XE, IBM PCjr, and Tandy 1000 computers. Only Amiga and ST versions are included in this review. The Music Studio from Activision is among the first of what promises to be a host of sophisticated music programs becoming available for the Commodore Amiga and Atari ST computers. It's an easy-to-use program, featuring pull-down menus and icons which are selected with a click of the mouse. The documentation consists of a small booklet explaining the available features as they are offered on both the Amiga and the Atari ST versions. Although the documentation does not include an index, it's straightforward enough to guide you quickly through the software. The program itself offers five basic screens from which to work. 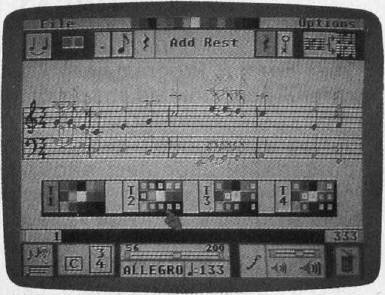 The Composition screen displays a treble and bass clef. Several icons appear along the border of the screen which allow you to adjust the volume, speed, time signature, and key in which the composition is to be played. You move the mouse to the note icon, select the type of note or rest to be placed on the staff, move the mouse pointer to the desired location on the staff, and fix the note in place with a click of the mouse. An ear icon in the lower left-hand corner will, when selected, play the piece as it is written. The Composition screen allows you to use any of 15 different sounds, or presets, which are included with the program. The different sounds, including bassoon, French horn, harmonica, and jazz guitar, are each represented by a different color. When you select the bassoon, for example, the notes appear on the staff in green. The notes for the French horn appear in blue, and so on. Since the Amiga allows you to play four different parts simultaneously, the color-coded notes help you to distinguish clearly among the four tracks being played. Lyrics can also be inserted within the score. The Composition screen includes a pull-down menu with options which allow you to cut, paste, delete, copy, and otherwise rearrange what you have written. You can even hear the score played back in half-time or double-time. If you aren't satisfied with the sound presets, you can create your own with the Instrument Design screen. This screen lets you create a library of your own sounds or alter any of the 15 sounds provided. On the Amiga, the Instrument Design screen displays the wave forms of any 7 of 33 possible harmonics, and these may be altered individually or as a group. (The Atari screen is slightly different, appearing more like the control panel on an early: model synthesizer.) The amplitude, decay time, and sustain time of each wave can be adjusted. The newly created sound can then be tested with the push of a button. If you like the sound, you can save it, and if you aren't satisfied with it you can either discard the sound or retain the sound you previously had. If you don't read music and don't want to wrestle with standard musical notation, The Music Studio also offers the Music Paintbox screen. This appears as a music staff, but the mouse acts as a paintbrush laying down colors rather than standard musical notation. Each color represents a different instrument and the user simply paints each color on the screen as he or she sees fit. The graphics for this are not exceptional, however, and to be perfectly honest, users who can't read music will probably find creating music with standard notation to be of greater interest. The Musk Studio can also be used with a MIDI (Musical Instrument Digital Interface) keyboard. An external MIDI keyboard (The Music Studio was written with the Casio CZ101 synthesizer in mind) requires a MIDI interface which, of course, is not provided with the Studio program. The interface allows you to write a composition and play it on the Casio, for example, using the sounds provided within the Casio synthesizer. The Music Studio has also been tested with the Casio CZ3000 and Yamaha DX-7 keyboards, the RX-15 drum machine, and the TX-7 synthesizer. When working with the Composition screen, you may also print out your score with any standard plotter or printer (one staff only). If you're using more than one instrument at a time, however, don't forget that the colors will not appear on a black-and-white printer. This is important since The Music Studio only prints one staff. And the color coded distinction between the different tracks is lost. If you want to get a feel for what The Music Studio is capable of, the software includes a number of prewritten tunes which illustrate its features. By selecting a tune from the song library, a transcribed version of the song will appear onscreen as the tune is played. The Amiga version of The Music Studio does not include a drum sound in its library, and the absence of a noise generator makes it impossible to create one with the Instrument Design screen. (However, the program can be used with a drum machine through a MIDI connection.) Also, if you're interested in using The Music Studio as a real-time keyboard (that is, playing the keyboard and hearing the music when you press the keys), then look for another program. The Music Studio does not provide this option. To briefly summarize, The Music Studio is an easy-to-use, full-featured music composition program that can be used effectively by both beginning and experienced musicians.